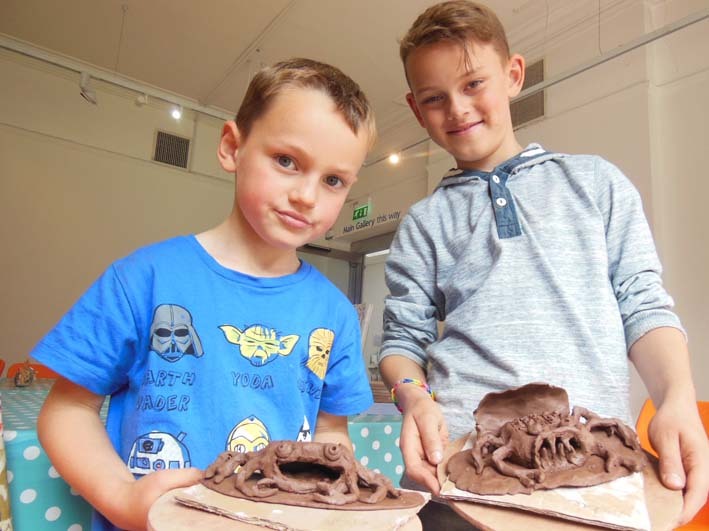 A couple of well crafted and quite frankly, ferocious looking clay crabs made by these young artists. The boys attended a drop-in family workshop entitled ‘Sea Critters’ at Bilston Craft Cafe in Wolverhampton on Saturday 30th July 2016. 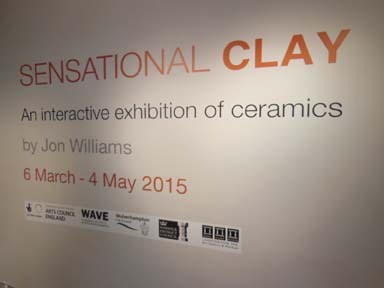 The Big Sensational Clay Sell-off! 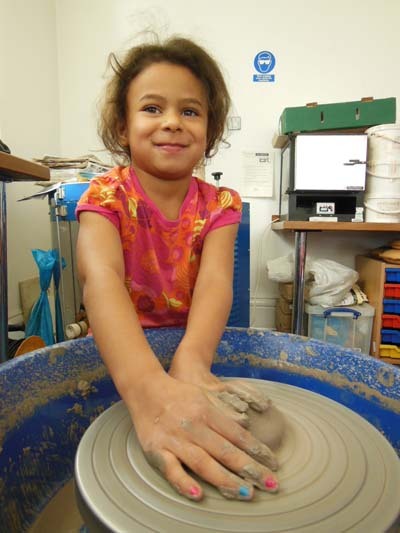 Had a lovely day at Bilston Craft Gallery at their annual garden party event. Not actually working with clay on this occasion but selling exhibits from my hugely successful touring Sensational Clay exhibition. 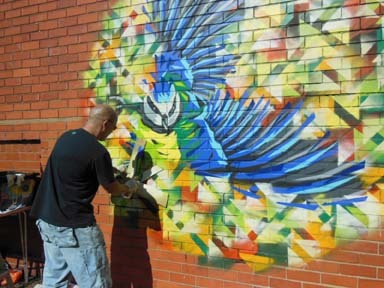 Steve Edwards a West Midlands basd graffiti artist was also present, adding a vibrant and colourful aspect to proceedings. I still have a few pieces left if anybody is interested in purchasing a Jon Williams original at a discount price. 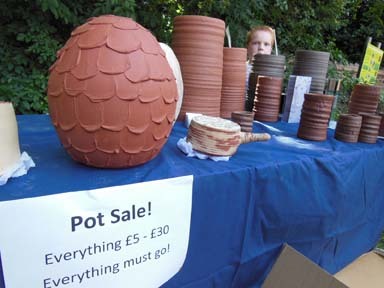 Please email me at: admin@eastnorpottery.co.uk for further details. http://eastnorpottery.co.uk/wp-content/uploads/2019/03/eastnor_pottery_header_2019-3.png 0 0 admin http://eastnorpottery.co.uk/wp-content/uploads/2019/03/eastnor_pottery_header_2019-3.png admin2015-08-25 10:12:262015-08-25 10:12:26The Big Sensational Clay Sell-off! The Great Sensational Clay Sell Off! http://eastnorpottery.co.uk/wp-content/uploads/2019/03/eastnor_pottery_header_2019-3.png 0 0 admin http://eastnorpottery.co.uk/wp-content/uploads/2019/03/eastnor_pottery_header_2019-3.png admin2015-08-04 08:21:182015-08-04 08:21:18The Great Sensational Clay Sell Off! The exhibition also had an airing in Cirencester, Carlisle and Worcester and by the time it closes at Leamington, will have been enjoyed by over 10, 000 gallery visitors. To celebrate the opening, I was invited to give a ‘Friday focus’ introductory talk followed by a practical workshop on the Saturday. 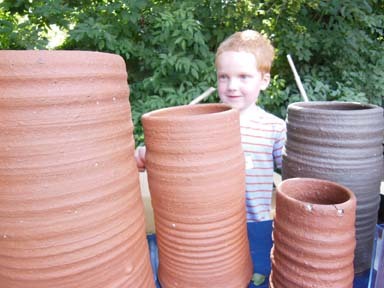 Participants were encouraged to use a variety of hand building techniques to make musical pots. A creative bunch for sure and some had their own kilns or access to firings. A lovely couple of days with some lovely people. 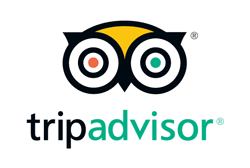 Thank you to all the staff and visitors who made me feel so welcome. You can see photos from the workshop by clicking here. Lovely clay work performance piece by Clare Twomey Is it madness. Is it beauty. More of my photos from the Gallery.